Scientists at the Naval Research Laboratory (NRL) are part of a research team that has detected water vapor in the atmosphere of a planet outside our solar system. The team, including scientists from California Institute of Technology, Harvard-Smithsonian Center for Astrophysics, Pennsylvania State University, and University of Arizona, applied a sophisticated Doppler technique to the infrared to directly detect the planet and demonstrate the presence of water in its atmosphere. The discovery is described in the March 10, 2014 issue of The Astrophysical Journal Letters. 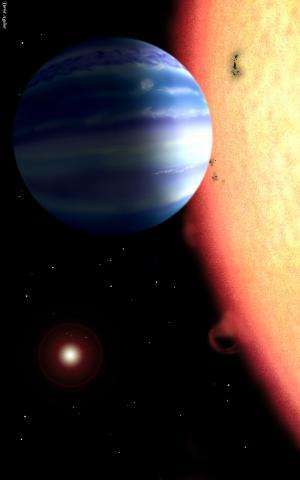 The planet, named tau Boo b, orbits the nearby star tau Boötis and belongs to a class of exotic planets called "hot Jupiters" that are not found in our solar system. A hot Jupiter is a massive extrasolar planet that orbits very close to its parent star. Unlike our Jupiter, which is fairly cold and has an orbital period of about 12 years, tau Boo b orbits its star every 3.3 days and is heated to extreme temperatures by its proximity to the star. Under these conditions, water will exist as a high temperature steam. While hot Jupiters are found to be relatively common in the Galaxy, the origin and nature of these planets remain the subject of intense research. The research team studied data collected at the W.M. Keck Observatory in Hawaii, using the Near Infrared Echelle Spectrograph instrument. Because a hot Jupiter is too close to its star to separate the planet's light from that of the star, the researchers adapted a Doppler technique previously used to detect low mass-ratio spectroscopic binary stars. Application of this method to tau Boo b, however, posed a huge challenge, because the infrared radiation from the star is more than 10,000 times greater than that of the planet. The analysis software to extract this minute planetary signal was developed by Chad Bender, a Penn State member of the team, while he was a National Research Council Associate at NRL. By comparing the molecular signature of water to the combined light spectrum of the planet and star, the scientists were able to measure the motion of the planet as it orbits the star and establish the presence of water vapor in the planet's atmosphere. The team also determined that the planet is six times more massive than Jupiter. Dr. John Carr, a researcher in NRL's Remote Sensing Division and co-author on the paper, said, "The detection of water vapor in tau Boo b is an exciting and important step in understanding the composition of these exotic planets. Our result also demonstrates the power of this technique for measuring water and other molecules in the atmospheres of planets, giving us a new tool to study the nature and evolution of extrasolar planets." Prior to this, scientists have reported detections of water for just a few other extrasolar planets. Most of these used the transit method, which requires a special orientation that causes the planet's orbit to pass in front of its star, as viewed from Earth. Alternatively, if a planet is sufficiently far away from its parent star, imaging techniques can be used to measure the composition of the atmosphere. However, most extrasolar planets do not fit into these two categories. The development of this new technique for exoplanets provides a means to learn about the atmospheres of this population of planets. This work is ongoing, with plans to further examine the physical properties and composition of this hot Jupiter's atmosphere. The research team is also applying this technique to search for water and other molecules in several other hot Jupiter exoplanets.